Beginning June 1, NWHL teams can re-sign players from their 2017-18 roster and their draft picks. Additionally, for those players who have completed their college eligibility and want to continue their hockey careers, NWHL Free Agency provides the best opportunity to continue playing at the highest level of professional women’s hockey. The fourth season of the NWHL will begin in October as the Metropolitan Riveters defend their Isobel Cup championship, and with the addition of a fifth team – the Minnesota Whitecaps – this will be the most competitive season yet. 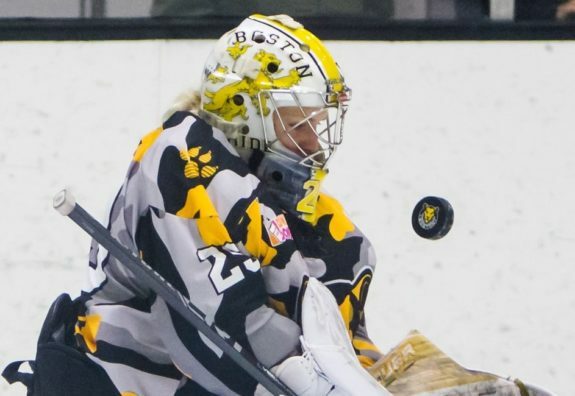 For all intents and purposes, the Boston Pride would not have been themselves if goalie Brittany Ott was not on the team. Word was released on Sept. 18, 2018 that the team’s original goaltender is now back for her fourth straight NWHL season in Boston. The 28-year-old Ott has played in 43 regular season games for the Pride since the league’s inaugural season, plus another seven games in the playoffs. Boston’s goal crease is now fully situated for the 2018-19 season. The first netminder to be signed by the team was the top overall selection in 2017 NWHL Draft, Boston College’s Katie Burt. That signing was the Pride’s very first to be announced this summer, for any position. Then earlier this month it was announced that Boston had brought back goalie Madison Litchfield who played her rookie season for the team during the 2017-18 season. She's cool ❄️, she's hot ?, she's our everything, she's Ott ?? @b_ott29 is back! Much of how the Boston net will look from here on out will fall upon the shoulders of head coach Paul Mara and how he decides to utilize his goaltenders. By no means will this be an easy decision to make. Ott has been the Pride’s bread and butter since the beginning. Litchfield served in a tertiary role this past season and did not get as much playing time as she probably deserved – there may be plenty of talent there which has yet to be tapped into. Burt is the next biggest thing as far as young goalies are concerned, and it would not be out of the question for her to be afforded an opportunity to be the decisive starter. If a logjam is ever a good thing, it is in this situation – it will just need some orchestration on the part of Mara. Including the three goaltenders, there are now 22 players currently under contract for the Pride. The team has the ability to sign three more skaters if they so chose. THW takes a closer look at what Ott’s return will mean for Boston and how she will help her squad recapture the Isobel Cup. Ott may very well be the most accomplished NWHL goalie when it comes to overall performance. Even before the league got its start, she had backstopped the CWHL’s Boston (now Worcester) Blades to a Clarkson Cup championship during the 2014-15 season. Ott immediately followed that up by leading the Pride to the first ever Isobel Cup championship for the NWHL’s inaugural 2015-16 campaign. She and the Pride would defend their trophy in 2016-17 before losing a 3-2 shocker to the underdog Buffalo Beauts in the Final. The Boston Pride’s Brittany Ott always has her eye on the puck (Photo Credit: Al Saniuk). Ott was the first recipient of the NWHL’s Best Goaltender award in 2016. Additionally, she is the only NWHLer to have played in each of the league’s All-Star Games. When you look at the numbers alone, it is easy to see why Ott has garnered the accolades that she has. In the first two seasons of league play, she appeared in 17 and 13 games respectively. Within those games Ott compiled seasons of .925 and .922 for save percentages, and posted stingy goals-against averages of 1.94 and 1.93. Her record in the first two seasons was a rather staggering 22-3-0. While the Pride faltered in the standings this past 2017-18 season, Ott’s numbers were far from poor. Compiling a record of 4-6-3, she put forth a .910 SV% and was the only NWHL goalie to have more than one shutout. She whitewashed teams twice during the regular season, the most noteworthy of which came Jan. 27, 2018 in a 1-0 shootout loss to the Buffalo Beauts when she stopped all 47 of the shots she faced prior to the shootout round. Additionally, Ott’s 2.50 GAA was the second best in the league last season of all goalies to have played more than one game. What Is the Best Option for Boston in Net? So who should the Pride go with in net once the 2018-19 season gets underway? Our money is on Ott, at least for the long haul. She is what some might refer to as a battler. Ott’s will to win is incredible, and it is a big part of why she has two professional championships. Talent is one thing, and experience is another – Ott has both. What Boston should do though is give both Burt and Litchfield opportunities to play. Particularly in Burt’s case, there would have been no need to draft her as the top selection just to leave her on the bench. In a 16-game regular season, one notion would be to play Ott in 10 games while splitting the other six between Burt and Litchfield. In this scenario Ott can impart tutelage to the two younger netminders with neither being held back, and still handle the bulk of the duties herself. The only other viable scenario is for Mara to ride the “hot” goaltender. For example, say Burt gets the start in the second game of the season (Oct. 20, 2018 against the Connecticut Whale) and wins, then Mara continues to play her in net until she loses. The same would hold true for Ott and Litchfield when either of them pull out wins. Certainly something to consider as a fair means of balancing the duties between the three. Meet #ThePack after every home game this season! ?Single game tickets are on sale now ? When it comes to the playoffs though, make no mistake – Ott is who Boston wants between the pipes. She has been to the mountaintop and brought them there with her. Ott’s experience and her ability to steal games make her the easy choice for the postseason. If Boston is able to win the Isobel Cup – which it appears that they have a very legitimate shot at doing – Ott will be the goalie to make that come to fruition. Goalie: Katie Burt, Madison Litchfield, Brittany Ott. Defense: Alyssa Gagliardi, Toni Ann Miano, Lauren Kelly, Lexi Bender, Kaleigh Fratkin, Mallory Souliotis, Kaliya Johnson, Dru Burns. Forward: Emily Field, Dana Trivigno, Denisa Křížová, Haley Skarupa, Jillian Dempsey, McKenna Brand, Amanda Pelkey, Taylor Wasylk, Gigi Marvin, Mary Parker, Jordan Smelker.